ALL OF MY PUGS AND PUPS ARE KC REGISTERED. I NEVER HAVE A LITTER OF UNREGISTERED PUPS. I BREED VERY LITTLe...but if you would like to visit and view my pugs ...to discuss owning a future Teaseltail pup..then please contact me. WE OCCASSIONALLY HAVE BLACK OR FAWN PUPS AVAILABLE TO APPROVED HOMES. OUR MALES WHICH ARE HEALTH TESTED ARE AVAILABLE AT STUD TO APPROVED KC REG PUG LADIES, PLEASE SEE DETAILS UNDER THE INDIVIDUAL MALES. PLEASE CONTACT ME ON MY MOBILE As at the present time we are having a few problems with the landline and emails but I will answer as soon as possible. If you can call my mobile number and leave a text or a message .... I will call you right back so you do not incur a cost to yourself. Thank You. WE MOVED HOUSE ON DECEMBER 7TH 2009..... TO A BUNGALOW IN A LOVELY SEASIDE SETTING. [WE ARE NEAR TO THE BEACH AND COUNTRYSIDE], THE PUGS LOVE IT ,AND SO DOES MY ARTHRITIS ,NO STAIRS,BUT UPLIFTING VIEWS AND SEA AIR. . ..I AM IN WALES,NO NOT THE OTHER SIDE OF THE WORLD BUT PRESTATYN, IN NORTH WALES. 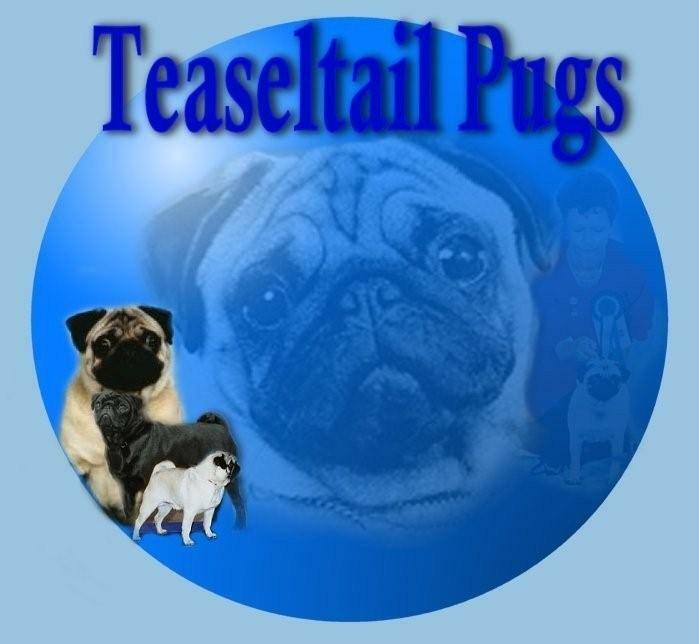 MY NEW EMAIL IS ann.highview@teaseltailpugs.co.uk. ALL CALLS AND TXTS SMS`S ETC WILL BE ANSWERED. MOBILE NO O7876711087 . The following web pages are an attempt to record some of the pugs we have owned please forgive me if i have got any details wrong..i am learning how to set this website together and it will take time. thank you for looking and thank you all for protecting our lovely breed by careful pug breeding.